Today's so so warm! Just a few days ago, it was so wet! Hoping it will be a cool day without much rain tomorrow. Possible? 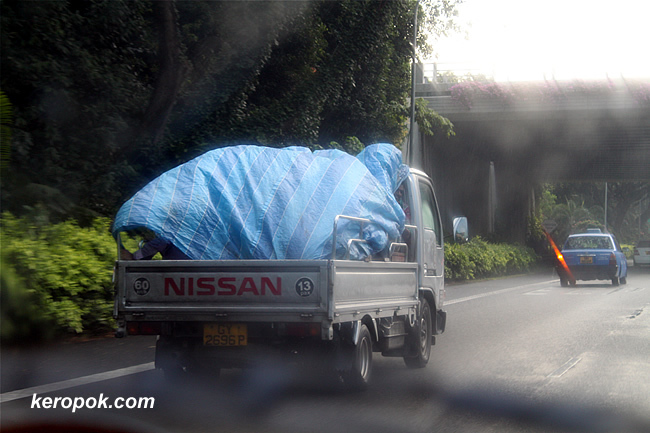 A photo of a truck that we passed by, below the blue cover are humans. It suddenly rained and they took out large sheet of plastic and covered themselves. Its just wet, wet, wet here! Glad they had some protection! Oh, was it yesterday, I think the govt announced that these trucks that ferry people need to have proper covering and acceptable height for the side barriers.